Last night we took a close up look at sets 21/22, and tonight I have some more 'wingmen' who will work with sets 23/24. Of course they all mix and match really well as you will see. First up we have Karen Daniell, my very close friend and she certainly was my right hand wing-man when I had my shop. Karen was a bit nervous about doing this for me, but her work is always so beautiful, she really has no need to be worried.......I would love it if she started a blog of her own to share her work with you......if you are reading this Karen.....nudge, nudge!!! My first project uses the Poppy stamp, which I knew I wanted to use as soon as I saw it. It works so well with the sentiment, so I painted and stamped a 6x6" grey/white board and layered the Poppies in one corner, and then the sentiment in the opposite corner. My second piece uses the beautiful Sunflower stamp - my favourite I think, as it just reminds me of summer. I painted a large Manila tag, keeping the colours fairly light, so that the layered sunflower would show up well against it. 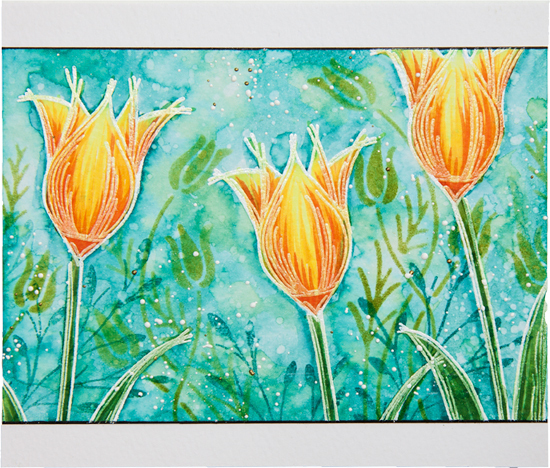 This project uses the elegant Tulip stamp. 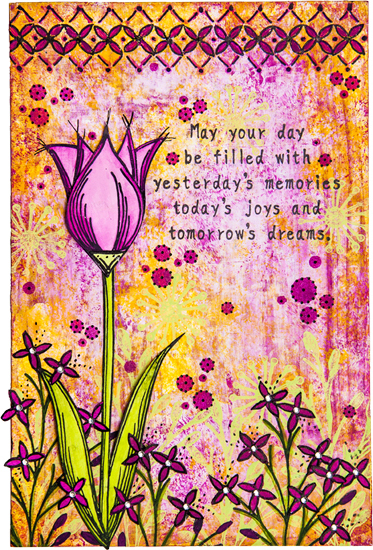 I stamped and cut this out on Smoothy card and layered it onto another painted and stamped piece of grey/white board. All of my three samples are created by embossing the main images with white detail embossing powder and coloured with Copic markers. The backgrounds are Distress Inks and accents have been added with a sprinkle of enamel embossing powders that have been heated from underneath. Although this sample was made using the same technique as the first, notice the dramatic change simply by swapping colours. 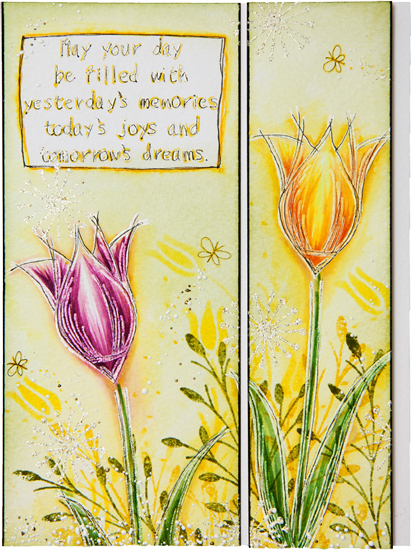 It's interesting how an alternative background colour really changes the golden tones of the yellow/orange tulip, from the pretty and delicate colour scheme of sample one, to a vibrant, striking colour scheme for this final sample. I wanted to use the gorgeous sunflower stamp to see if I could make a different style of flower - I rather like it! 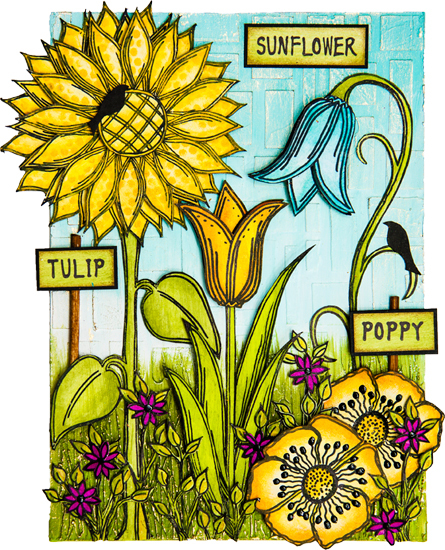 The flowers are all painted on tissue paper which, although delicate, allows you to build up colour on both sides of the paper meaning you can get some really rich results, especially on those fabulous tulips! I love Lin's Bougainvillea paint - I think it's my favourite ever and so I brayered Tangerine Twist, snowflake and Bougainvillea in lots of thin layers to build up a real depth of colour. I love the little accent beads as the centre! 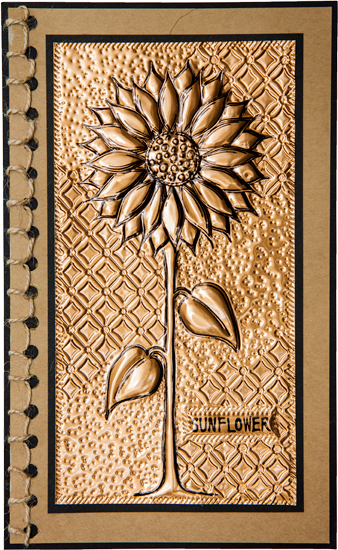 When I first saw the sunflower stamp I knew I had to create a 3D flower. Using book paper on Clearly for Art, I painted the flower and the heated it to make it mouldable. I was going to embellish the centre but couldn't bear to cover up the text! I'm sure Leandra will have smiled to herself when she saw this project for the first time. I can remember commenting on her favourite pink and orange colour combination... in not a favourable way... and here I am using pink and orange and not for the first time either!!! I normally like to use opaque colours for the 'splodger' technique but I opted for Bougainvillea and although it is a semi-opaque, it is highly pigmented and works a dream. The translucent colours over the top are Tangerine Twist and Tango. Step Two: Adding colour to the stamped images. Don't forget to heat set any stamping with Archival ink before painting. Step Three: I sponged Snowflake Fresco Finish on to my stamp followed by Limelight to create a more opaque version of Limelight. I found if I mixed the two colours together before applying to my stamp, the white over-powered the green. Here's a close up... so you can see some of the layout in more detail. 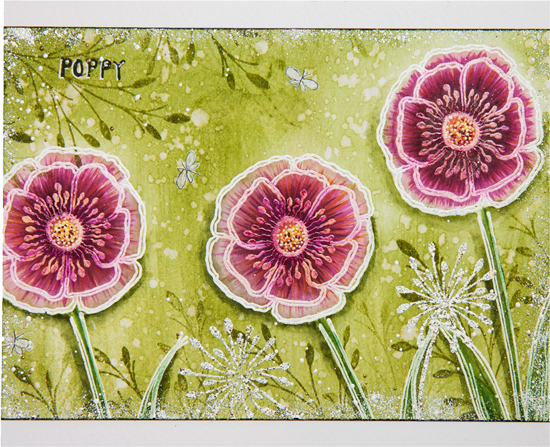 All the flower elements were stamped on to pre-painted Smoothy cardstock. 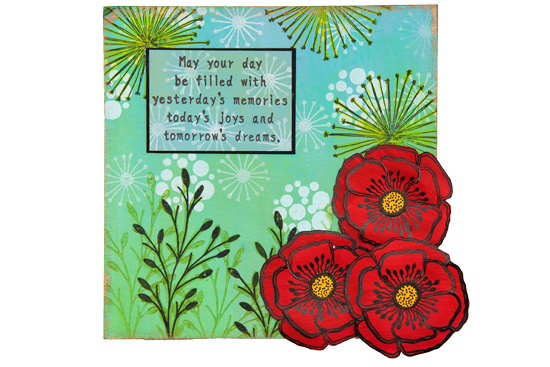 If you enjoy a challenge, all the tiny flowers were cut from the border stamp on ELB23!!!!! As a finishing touch to my background, Bougainvillea through stencil PS001 with added blacks dots were just the element to fill in gaps. Although the intention this evening was to focus on stamp plates ELB23 & ELB24, I really wanted to create a garden so I've actually used stamps from all four plates!!! My project is built on one of PaperArtsy's 5" x 7" white/grey board substrates, it is the perfect size for my flowers. Step One: Having prepared my board with a layer of Grunge Paste through Emma Godfrey's stencil PS016 and scratched a pokey tool through some Grunge Paste at the bottom of the board to create some grass, I set about painting the background. First, a stripe of Snowflake across the centre followed by a stripe of Caribbean Sea at the top. Step Two: Blended both paints together with a touch more Snowflake. Step Three: And Finally Hey Pesto for the grass. When dry, I added a small amount of Classic Treasure Gold to to texture of the Grunge Paste. Step Four: All the flowers were stamped with Jet Black Archival ink onto Smoothy cardstock that had already been painted with Fresco Finish paint. Highlights and accents were added with translucent paints after I had heat set the ink. Here's a close up ...not sure how well it shows in the photograph, but I found that tiny dots of Ranger's Black Enamel Accents added a lovely finishing touch to the tiny flowers and poppy heads. I still love working with metal, and this large sunflower is an ideal image for all my favourite metal working techniques so I couldn't let this opportunity pass by without making one metal sample. Step one: I always use StazOn Ink for stamping on to metal, because its a solvent ink, it dries really quickly and gives a crisp, sharp image. I stamped the head of the sunflower first, made a mask before stamping the stem to ensure there was no gap between the two. Step two: Using a stylus, trace over the image. Step three: For interest, I added the sunflower message. Step Four: I flipped the metal over, leaning on a foam mat, I used a paper stump to puff out the back of the sunflower. These embossed areas will need filling to protect them so I filled them with Grunge Paste. Step Five: I decorated random areas of the background by rubbing over a rigid Ten Seconds Studio mould with my paper stump, then refined with the teflon toipped tool and filled in the gaps with a stippled effect using the teflon tipped tool. Here's a close up.....I made a separate centre for the sunflower with has been mounted onto card for stability. Birds in the Barn Marks Tey, Essex: July 25 - demos, July 26 - Shadow Box class. Stamperama show, Stevenage: August 2 - Demo on PaperArtsy stand. The Craft Barn, South Nutfield, Surrey: October 3 - demos, Oct 4/5 - classes. I have thoroughly enjoyed making all the samples for these blog posts and I hope that my guests and I have inspired you to try one or two of these ideas yourself. I always find that new products bring out new found creativity in all of us, so I hope that you will enjoy using these new stamps just as much as we have. Don't forget, the Topic 12: Stencils challenge is open for an extra week while the new product announcements take place this week. You have until Sunday, July 12th 5pm London time, to link your art. Perhaps Lin has inspired you to do some metal work tonight? It's a perfect fit with the Shiny Stuff Topic!!!. Perhaps Lin has inspired you to do some metal work tonight? It's a perfect fit with the Shiny Stuff Topic!!! Lin, your new stamps are fabulous, and you and your wingmen have produced some more fantastic samples again tonight! I love the copper flower, it looks stunning. What fabulous samples by you, Lin and your talented wingmen for tonight! Oohs and Aahs from beginning to end of the post. I absolutely adore the metal sunflower! I caved in last night and ordered the two sets showcased in tonight's post (& a Hot Pick set too). Can't wait to play some more when I have all four sets. They are just beautiful. Well done Lin and also to the other girls for their stunning projects. These stunning samples really show case those blooms beautifully! FABULOUS new creations Lin and thanks bunches for so many wonderful samples and tutorials.... what a great post... wow. j. All the samples are stunning - and I agree that Karen Daniell needs to set up a blog. Her work is beautiful and I love attending her workshops! Gorgeous samples. They show off the new stamps wonderfully. stunning samples from everyone! the colours are striking & inspiring! What beautiful work -- what gorgeous projects -- can't get over them. I thinnk you're all marvellous ---- but you couldn't do it without our Lin at the helm producing such wonderful stamps to work/play with. Thoroughly gob-smacked by it all! These creatoins and stamps are really beautiful. Thank you for us to share these tutorial. Stunning projects - trouble is now I want ALL the stamps!